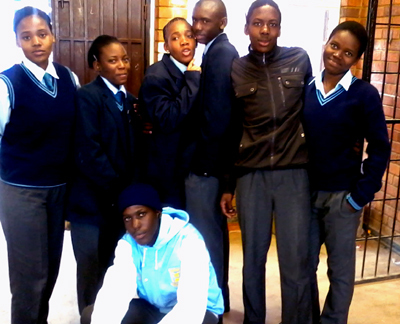 Reasoma High School in Gauteng province, South Africa, is one of a cluster of schools to adopt the Room 13 project after its successful introduction to the region in 2006. Room 13 Reasoma has been established as a space for painting, sculpting and performing arts. In addition to their regular Artist in Residence, the studio also benefits from the expertise of Artists in Residence from other nearby Room 13 studios. They seek professional support when necessary to explore other forms of art dance, literature and performance. The artists of Room 13 Reasoma have completed mural projects around the school, and regularly engage in collaborations, exhibitions and public performances. They are keen to branch out to share their work with other schools and generate income to improve the sustainability of their studio. Room 13 Reasoma is one of the studios whose development is supported by TBWA\ South Africa. “Room 13 is a place for us to express ourselves, where we find knowledge, learn new things and gain confidence. It is a place where your creativity can be discovered and utilised to encourage not only yourself but others with the potential.